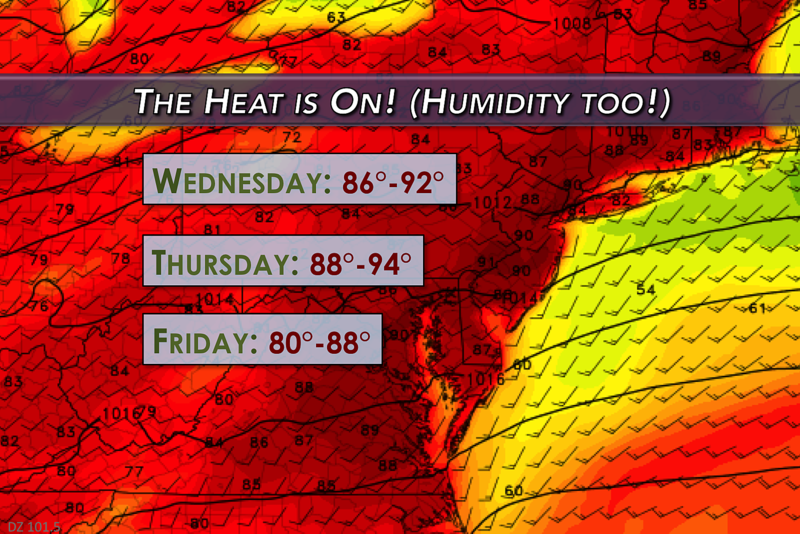 Even in the middle of summer, Wednesday would be a ferociously hot and humid day for the Garden State. Hello, summer! Well, summerlike weather, at least. As high pressure parks south of New Jersey, southwest winds will carry in much warmer and humid air. The result will be two days of near-record temperatures and stifling humidity. So, allow me to remind you of common sense hot weather precautions... Dress for the weather. Stay hydrated. Take frequent breaks. Use sunscreen. Don't leave pets or kids in cars. Another important side effect of the heat will be elevated concentrations of ground-level ozone and fine particulates. In other words, pollution gets trapped near the ground. This can cause breathing difficulties for sensitive groups, including the very young, the very old, and those with respiratory problems (like asthma). If you fall into any of those categories, air conditioning will be your friend. The NJ Department of Environmental Protection has issued the first "Code Orange" Air Quality Alert of the year. Wednesday night? Not cool at all. You will definitely feel the mugginess and stickiness all night. Under partly cloudy skies, low temperatures will only fall to the upper 60s to around 70 degrees. Pretty uncomfortable. And if Wednesday's heat wasn't enough for you, we'll do it again on Thursday. High temperatures will again soar into the upper 80s to lower 90s. (I suspect Thursday will be a degree or two hotter than Wednesday, just in case you're keeping score.) Again, skies will remain dry, and we'll see a mix of sun and clouds overhead. Friday will start off very warm, with thermometers climbing to the mid 80s (give or take) by lunchtime. But then, changes will be afoot! A cold front will put an end to the heat and humidity, as a brisk northwest wind will begin carrying in cooler, drier air. Usually, such a strong cold front would also spawn a line of strong thunderstorms in such a warm and humid environment. But models show storms really won't fire — the NAM is completely dry, while the GFS does show some rain activity. So while I'm not completely ruling out some isolated showers and thunderstorms for late Friday, the chance admittedly looks quite minimal. And then along comes the weekend, not nearly as summerlike as the rest of the week. Over the past few days, I've been wishy-washy about a potentially unsettled forecast for the weekend. And, while confidence is still shaky, I like what I see to salvage a "decent" weekend. It's clear that temperatures for the weekend (and beyond) will be nowhere near 90 degrees. The big unknown in this forecast is the magnitude and effects of an on-shore flow — southeasterly winds usually enact overcast skies and cool temperatures. My current thinking keeps most of New Jersey in the 60s for both Saturday and Sunday. We'll probably see more clouds than sun, but the forecast now looks dry throughout the weekend. Our next storm system of significance will be another strong cold front late Monday. Severe weather and pockets of heavy rain will be concerns.